On Wednesday October 6th the first test fights between Dennis's Evil Empire and my Sir Dinadan took place. There were a total of 3 test fights. Above is a short .gif of still images from the third test fight, which shows my robot running out of the ring in the beginning. If this was a real fight Dinadan would have lost when he did so, but because it's a test fight I put him back in the ring. After that the two went at each-other and with Evil Empire's right side to Dinadan's front Dinadan was able to use his polearm to hit EE's main kill switch. Mostly EE ran into the polearm. Frames 4,5 and 6 show Dinadan making the kill. All three fights were short compaired to my first fights with my first generation fighters; but there is still a certain amount of luck in the robots making a kill I think. Before the second match I took Dinadan and added 2 AA's to bring his maximum available servo power up to 9 Volts. He was running on 4 AA's which is 6 volts. EE runs of 8 AA's but gets about 10 volts from that so the two I added helped even their speeds out. Dennis used proper hobby servo wheels which makes his bot run better. I on the other hand used monster tires and did not have alternative wheels, so I was stuck with the monster wheels. The only other thing I could change was the program and I sure did! My first program was nothing but sloppy junk. I cut half of it out and simply told Dinadan to go forward if you see something to the right or left turn into it so the object becomes centered, then ram forward. If you see the edge of the ring, back up and turn right. The second fight is not uploaded here, but in summary both fighters stayed in the ring. They each followed each-other for a few seconds and the match ended when Dinadan was chasing Evil Empire and by luck hit EE's back alternative kill switch. I can see right now these fighters need eyes in the back of their heads! 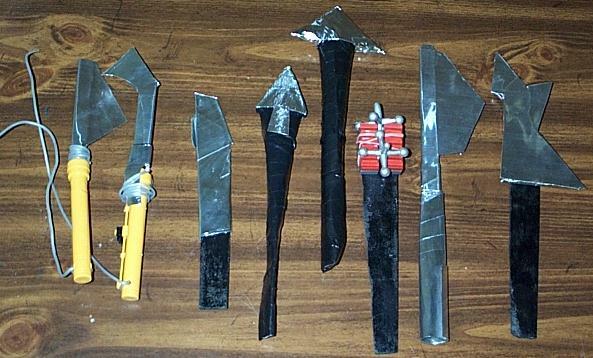 The polearm I used in all three fights is pictured here and is the second one from the right. It's the all metal polearm with a triangle pointing to the right. This design as I predicted from my extensive research into polearm design (yeah right!) was very effective in being able to reach the shut off switches of opponents. In the first fight (click here) my dismal program and EE's (Evil Empire's) superior speed and method of attach helped EE easily win over my robot! The First test fight was a disaster for Sir Dinadan. You could see on the fighters face an sense of shock and dismay. Dinadan was on the run from the start and even ran out of the ring (due to my poor programming skills). But there would be no saving him as he was sat back in the ring it looked like he might have a chance to show EE what he was made of as he charged directly at him. This lead to his demise. EE's speed allowed him to escape and turn on Dinadan for an easy kill by hitting his side shut off switch square in the middle! Sir Sagramore went down in battle as an great warrior should. To see an avi (150K) if the last seconds of the match click here. Lab rats at Ratliff Robotics have carried Sir Sagramore away to their secret underground cave and roamer has it they can be heard chanting and ancient spell in hopes of bringing back Sagramore to rise again like the mythical phoenix. The ring I am using is a large all white trap with a 8x8-foot square marked off by 2 inch wide black duct tape. The test fights took place in my garage but I am keeping an eye out for a more scenic location. Want to see my old First Generation, no micro controlled fighters fight? Click here. My ultimate goal with my fighters is to cultivate robots that know how to guard objectives such as a recharging station; these robots being the Defenders. And to develop robots that can attack and occupy what the Defender is trying to protect; these being the Predators. Having the object of their affection be their shared life line, a recharging station allows one to see which is the winner as one or one group of robots would die, due to lack of power. Another way for the robots to "die" in these fun scraps is for one to be hit on a contact sensors that will cut power to the robot's drive wheels. Thus the robot would be rendered paralyzed. At present there is not a power station for the robots. That will be a part of the fights in due time when we start having team events. Even when we have team events we will still have tag matches as to not alienate anyone. We are going one step at a time on this project. To learn more about the technical aspects of my robots click here. Right not there is no real distinction between the robots as to which are predators and defenders other than perhaps the tactics they use against one another. Also if someone out there is working a project similar to mine then please feel free to drop me a line.